CR Wood was a former director of DPR. I have the history of the department on hard copy if your interested. I remember going to that park with my teen-aged siblings a couple of times in the late 60s when I was very young. I don't remember if there was anything tangible to back her fears, but when my mother found out we were going there she threw a fit and forbid it. She said the area was "dangerous" and "bad". I've no idea why she thought that, but she seemed to be under the impression that it was not a safe neighborhood at that time. Of course most of us who lived in the county felt anything downtown (or close to it) was not "safe." My sister told me that a child once was decapitated when s/he fell from the old hand-push go-round (I don't know the proper name for it). Again, I was too young at the time to know if that is true or not. Wow, some very cool photos. Thanks so much for sharing! Gary, I regularly read and appreciate the info in your blog -- and I'm a structural engineer. I hope I speak for everyone in the profession when I say that protecting the public is the first thing I am sworn to do. Not the contractor or owner or preservationist, the Public. If I am called to render an opinion on a pooly maintained or unsafe structure, my opinion cannot be influenced by historical significance, politics, budget, etc. That said, I wish you well in your efforts. I hope the business needs of the community will align with the need to restore and maintain these old buildings. I was probably too harsh. Since engineers are trained to be risk-averse, for the reason you mention, I haven't ever found that, when the city or a demolition-minded developer brings in a structural engineer, the opinion ends up supporting (npi) the ongoing integrity of the structure. You can argue that the engineer's opinion is a calculus, unbiased by the things you mention. I don't quite believe that, and I think that the language in the conclusions tends to shade one way or another. But that's my opinion, and I'll concede the point, as I don't wish to impugn the reputations of all structural engineers. Instead I'll just say that the structural engineer's opinion is usually used to justify a pre-ordained conclusion when demolition is intended, and is treated as the only truly relevant assessment of the structure's value, rather than one facet. Living in the Southeast, outdoor pools are in much demand to "beat the heat" for 5 months of the year. It is a shame the outdoor public pool is not something that city parks and rec supports. Indoor aquatic centers can be used 12 months of the year, and I'm sure are advantageous for the athletic swimmers of the community, but for the kids and adults who just want to have some fun in the sun, the indoor pools don't offer much. Seems unlikely to happen but I'd prefer to see any new pools the city builds to be outdoor ones. Until then I guess we have to be content sneaking into the private pools of certain neighborhoods and complexes. (and of course the Eno has some nice spots). Gary - thanks so much for this. Sorry i wasn't able to comment earlier, been in DC for the inauguration. Just so everyone's clear, we (meaning both Duke Park Neighborhood Association and Duke Park Preservation Initiative) have had a number of folks evaluate the bathhouse for potential renovations. Nobody has thrown up a red flag saying the building is beyond saving. It's clearly a worthwhile project, especially since our latest estimate from parks and rec to demolish the building and replace it with a minimalist cinder block bathroom structure is in the $200K vicinity. It probably wouldn't cost much more than that to renovate the structure, and since DPPI is a 501(c)3 corp, it's able to receive both tax deductible cash donations and in-kind donations to complete the project. When the Beaver Lodge first approached Mr Bain, the Duke Park caretaker, about the first Beaver Queen Pageant he shared many stories about festive pool events. One I enjoyed hearing told of a cable that was rigged across the pool, a UFO type structure was attached to it carrying a "beauty queen" who was then dropped into the pool. Wish you could find a picture of that. I love the picture you posted of the swimsuit beauties. The current Beaver Queen Pageant is billed as Beaver Drag for the Entire Family. Contestants are judged on the quality of their tails and their Wetland Ready Wear. Drag pageants seem quite the tradition in Duke Park. I recall visiting Duke Park on occasion a youngster in the late 1960's to early 1970's for church picnics and family outings. I remember lots of hardwood trees with acorns everywhere, and the most extensive facilities of any park we'd visit in Durham, including a large picnic shelter and lots of playground equipment, featuring a really cool long sliding board. I also remember standing at the edge of the hill on which Duke Park rests and overlooking the interstate with its steady stream of passing cars, and the goings on along Avondale and Roxboro streets beyond the highway, which was a memorable experience. Like the present day, Durham was a heavily wooded area which offered few natural overlooks. Just beyond the interstate on Avondale, one could see the Big Boy restaurant with its statue of Bob out front. I found the statue to be equally weird and compelling. Come to think of it, I still do. You're in my neighborhood now. God Bless your soul. You're doing good here, keep it up. I remember that Big Boy statue getting stolen a lot and ending up just about everywhere in town at one time or another! You could almost start a whole new blog between where the Big Boy ended up and how the Duke statue statue on the main quad has been garbed over the years. 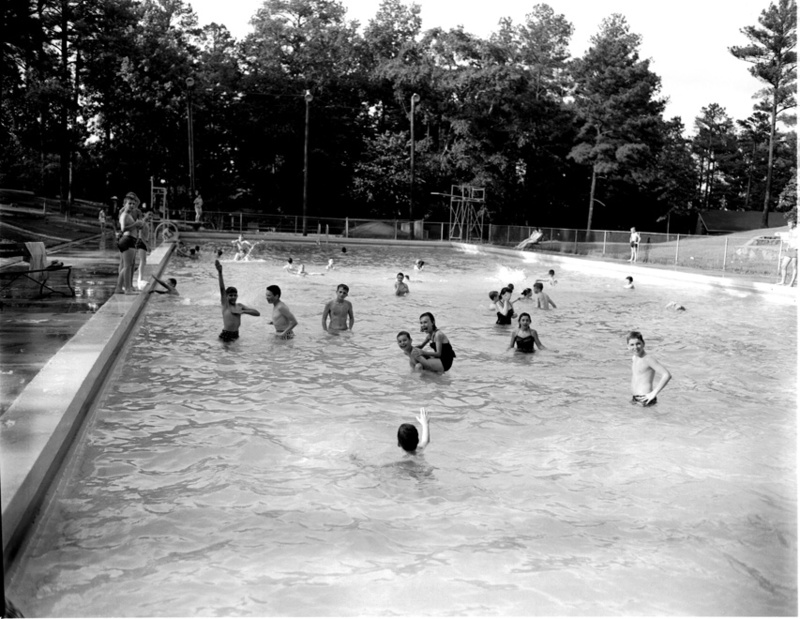 Kids growing up in the 1930s could take Red Cross-sponsored swimming lessons at Duke Park pool. Those of us who didn't have a dime to swim recreationally would 'learn' to swim every summer. The instructors recognized us, but didn't object. If memory serves, lessons were given in the morning before the pool opened to the public. I hope you will attend the Beaver Queen Pageant. Beaver Lodge Local 1504 returns pageantry and community quirkiness to the old pool site. Who knows what will happen at the pageant--scandal, improv, rain, heat, urban wildlife running amock..? Join us in creating another Durham story. I'll have a VIB All Access Pass for you and two tickets to the After Party. Marty Jarrell is handling the VIB area, see her near the judge table if I don't find you. Seems like the guy 'saving' the girl swimmer was named C. B. Davis. He was a heck of a diver off the one meter spring board and inspired several of us to enjoy the sport. The polio scar brings back a memory. More strongly, though, is the picture from 1957. Several of us spent almost every day there that summer - sometimes for the morning and afternoon session. The pageants and clowning around were exciting times to sit with Mom, beyond the fence in the bleachers on a summer night with the cicadas going crazy among the human sounds of commotion. I spent many a summer day swimming in the Duke Park kiddie pool and the big pool, from the time I was about five years old and lived in old North Durham to the days when I "graduated" to the big pool and we lived on Washington Street at Englewood Avenue. I remember we would rent wire baskets to store our clothes in and would pin the big safety pins to our bathing suits. Pins came with a metal disk with the basket number on them. Still have movie film (now copied to video tape) of my sisters and me in that kiddie pool. 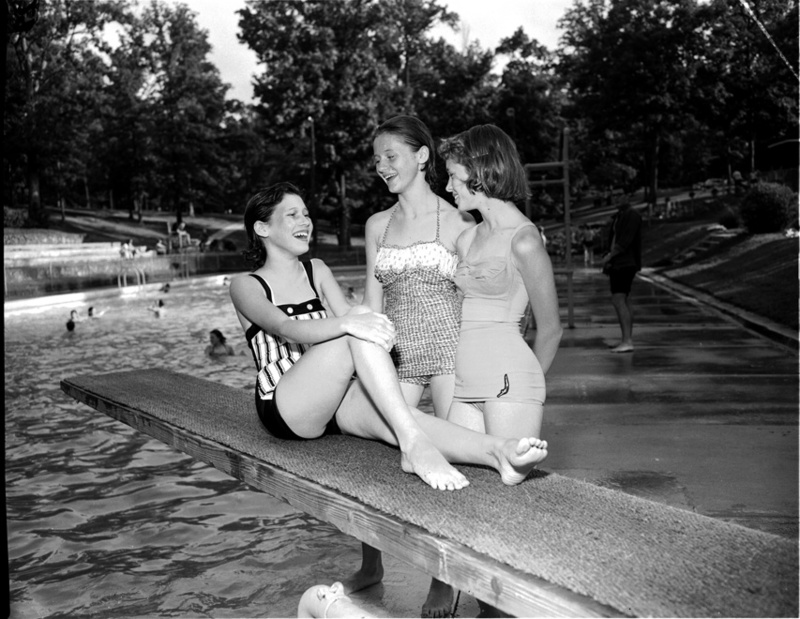 The photo label Duke Park Pool 6-17-57...I believe is dated incorrectly. The happy little boy in the front right corner is my brother "Eric Nicholson" and he was born 7-23-57...so he was probably 10 in that photo and it should have been 1967. I learned to swim in that pool and so did my kids. I was born in 61 and my sons were born in 90 and 92. I had great times at Duke park. Easter Egg Hunts, learning to Swim, kissing my first boyfriend, stolling my babies and have birthday parties at the shelter. I loved that neighborhood and park...going on 5 decades this year. My sister, Penny, and I would spend many days at Duke Park Pool...walking both ways once we were old enough to walk alone...prior to that, our mom took us...starting with the baby pool and graduating to the big pool. We were allowed snack money but could only get a snack after swimming...I guess our mom thought the rule about swimming right after eating pertained to snacks, too. Anyway, my snack was always a Pepsi, fritos and a frozen Zero bar. We would stop by the snack bar with our wet bathing suits rolled up in our towels, get our snacks and find our way home. 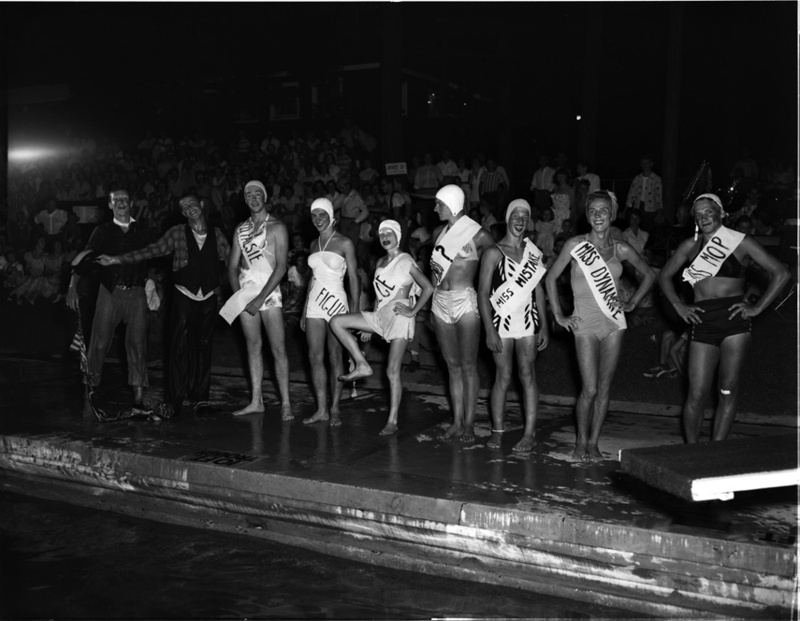 I loved going swimming there and love the water pageants. Great family fun. To those of you who see all of Duke Park as prime park real estate, and see that old bath house as vital Durham history that deserves preservation, I'll offer my opinion as to why Parks & Rec has utterly disregarded it. It's a shame since it's Durham's oldest park, and presumably gave rise to that department in the first place! First let me describe my perspective, so you know who's opinion you are reading. When I moved to Duke Park 30 years ago, there was already a parade of parents begging for better maintenance, decent bath rooms and new playground equipment. I personally thought that antique playground was the bomb, but changed my mind when my oldest child tried to play on it. So I joined the parade 27 years ago, and have been begging, (fighting, bitching, lobbying... whatever you want to call it) ever since. Many years ago, I joined the board of Duke Park Preservation Initiative with the expressed purpose of adding to the nonprofit's mission to preserve all of Duke Park, including the bath house. No one objected, and I eventually became vice President, and about 6 years ago, President. The idea behind the lease Barry mentioned, was to attend to the bath house if the city wouldn't, and it required DPPI to renovate and maintain it for 20 years renewable. The city spent $14,000 on a study to determine their cost of renovation would be an insane $980,000. If that seems impossibly high, note that the city spent ten times that amount building the Walltown community center, and the two buildings are exactly the same 2800 square feet. I've heard that certain city council members don't appreciate that comparison, which I liken to your dog not appreciating you rubbing his nose in the present he left you on the living room rug. That's not to say Walltown shouldn't have gotten their community center. Both Walltown and Duke Park stood behind each other in requesting both community centers, but no one should applaud the outrageous $9 million cost associated with building that structure. But back to Duke Park, and why Parks and Rec appears to hate it. They don't hate it, in fact, they like it a lot. But they don't see prime park real estate the way we do, they see an ideal "centralized" distribution point from which to serve the other parks. No one would argue that Parks & Rec doesn't require some space to operate from, but so do the folks who maintain our schools. If the school maintenance crews suddenly and independently, decided to close down a popular elementary school and convert it to their own use, I doubt they'd get approval from either the public or management. Neither would Parks & Rec, so they never bothered to ask. Perhaps the best illustration of this opinion is found in the parking lot beside the bath house. Note the fence around it and the locked gate. That went up during an unusually long period the park was closed due to a few fallen trees. Without any public discourse, Parks and Rec spent $5,000 of the taxpayer's money to take that public parking lot and convert it to their own use. They clearly see their need for space to store trash cans as more important than the public's need to park. If a resident decided to change their home from residential use to industrial use, we'd have to go through a rezoning process, and neighbors would likely object like crazy. They'd site the large trucks that would be coming down residential streets, and that the industrial use wouldn't fit in their neighborhood. So Parks & Rec didn't ask, they simply converted the caretaker's historic house to an industrial compound and put up an ugly fence around it. Now, if you agree with my opinion so far, you might wonder why Duke Park is so poorly maintained if the maintenance crews have made their home base there. You might expect the opposite, that it would be the best maintained park in the city, because the crews are there every morning and night. The unfortunate fact is that any improvements to that section of the park would attract pesky park visitors, and that would put pressure on Parks & Rec to return the use of that stolen parking lot. If the tennis courts had nets, people would want to play there. If the field where the old pool was located was in better shape, people would want to play on it. God forbid the bath house was an active community center, because even more people would join the tennis players in wanting to park in that parking lot. If that explains how we got here, let me also explain that there is light at the end of the tunnel. I've been told that some new digs have been secured and Parks & Rec should be out of there in about a year. Perhaps then it would be safe to improve that field and remove the fence and return the parking lot to public use. DPPI could have sought state grants to cover half of the city's expense in saving the bath house, but that would have required willing partners. Hopefully I've explained why Parks & Rec was anything but a willing partner. Perhaps that will change when they move to a new location. Lastly, Gary, let me update your blog as to the most recent developments. Due to the attention Duke Park has recently experienced, several things will actually take place - we've been told. New bathrooms will be constructed to end the oldest complaint about hygiene and kids using the bushes. New mats will be installed in the toddler play area, even tennis nets may appear soon. Some of the erosion issues should be addressed, new trees planted and the bath house will remain (hopefully) as a future project for a younger parade of parents and advocates. As one of the original parade participants, I'm pleased that we'll finally have decent bathrooms to service the awesome playground, but disappointed the bath house will remain untouched for now. Meanwhile, we'll still have heavy trucks coming down lovely residential streets like Acadia and Knox, from the industrial compound. Personally I'd favor returning the entire park to the way it operated in the 1940s, with maintenance performed by the care taker who would live in the house just as Mr. Bains does today. So preserving that position of caretaker is as important to me as preserving the buildings. A Director with the state's Preservation office was touring the bath house with me a couple years ago. He mentioned finding the photo above that you included mostly to show the original bath house, and noted the six pane windows it once had. If it is ever restored, as so many folks seem to want, it will indeed have six pane windows. Without Endangered Durham, we probably would never have known. Wow! I would love to see that video. Is one of your sisters Fabian? I spent many wonderful summer days at the pool with friends. I remember it so well and it always brings fond thoughts to mind. I remember, "Showers Before Entering Pool" were mandatory. After, well...it was up to you! Marta, I do hope you see my reply. I just noticed your message today. Yes, my sister is Fabianne. Do you have a relative (cousin or brother, etc.) named Alex Molina? There was a Molina family who lived on W. Knox Street in a pretty ranch style home at the corner of Washington Street. The video I have is of my sisters and me in the Duke Park kiddie pool. I couldn't have been older than 4 or 5 years old. Great photos..... my sisters and I spent many summers, going to the park pool every Wednesday to spend hours in the pool. We took swimming lessons there and were so excited when we could go to the deep-end of the pool to swim for our instructor and pass swimming!! We also enjoyed the swings and that incredible merry-go-round and that tall slide. We also lived close to the park at the corner of Everett Pl and Washington . Glenda, the Johnson's (who open/owned/operated Johnson Motor Company) lived in that house before the Molinas; both families whom I remember. We were only one block down from that intersection of Knox and Washington. Loved that neighborhood. Lots of great memories. Glenda....you're a memory from the past! I was a friend and neighbor of your sister, Karen. We lived on the corner of Everett Pl and Washington Str, one block up from you. Yes, many great memories of the Duke Park pool. Remember those safety pins well....lol. It's wonderful you still have a video of your times at the pool. So many of us had grat times and now great memories. Duke Park, originally part of Brodie Duke's large landholdings, was farmed by farmer Lee Perry during the early 20th century. It was also evidently used by surrounding neighbors to surface mine coal - Durham's primary heat source prior to its usurpation by oil/gas heat in the mid-20th century. Per Jean Anderson, the Junior League was at least in part responsible for persuading Duke to donate the land for a park sometime in the 1910s. Duke owned most of the surrounding land, and had begun plotting streets and selling off building lots, primarily to the south of the current park, between Glendale and North Roxboro prior to his death in 1919. The residential neighborhood of Duke Park, surrounding the park itself, came into its own in the 1920s with the rise of private automobile ownership. Large period revival homes and bungalows, in particular, were developed along adjoining streets. There is little information about the park itself during this era - because the area immediately to the north, now occupied by I-85 was a natural ravine, the park likely had no distinct northern boundary, blending with the rural landscaped that stretched north to Bragtown. Most likely, the land stayed as it had been, although it's unclear whether grazing, farming, and coal digging still went on. In the early 1930s, though, Duke Park became one of several Durham parks that were redeveloped by the Civil Works Administration and Emergency Relief Administration of North Carolina as agents for the Federal Works Progress administration. Jean Anderson notes that "CR Wood applied for Reconstruction Finance Corporation Funds to establish five recreation centers [in city parks]" I don't know who CR Wood was. Evidently the construction at Duke Park was opposed by some of the tony new neighbors, who were likely not digging up their own coal and grazing their cows nearby. The opposition included Richard Wright, II who lived nearby at 1429 N. Mangum, and local lawyer Basil Watkins. Per Jim Wise, the opposition claimed that the park would attract "an influx of undesirable elements." Despite 75 names on a petition and a rant about cutting down trees for swimming pools, the trash produced by visitors, and the expense of maintaining the park, the anti-park posse lost. Marshall Spears, chairman of the recreation commission, pushed forward with the construction of a pool, tennis courts, swings, shelters, stone entrances, and a bathhouse, all completed between 1933-1935. These facilities appear to have been extremely popular through the 1940s and 1950s. I simply stopped scanning pictures of the Duke Park pool after awhile, as it appears to have been the reliable annual harbinger of summer for the crowds to arrive at Duke Park pool. Duke Park was segregated, as all Durham Parks were, and only accessible to white people. I was rather surprised to discover the "Duke Park Water Pageant" in existence as early as 1949. I have no idea if the present-day "Beaver Queen Pageant" organizers were aware of this history of Duke Park, but, if not, it's rather amazing. 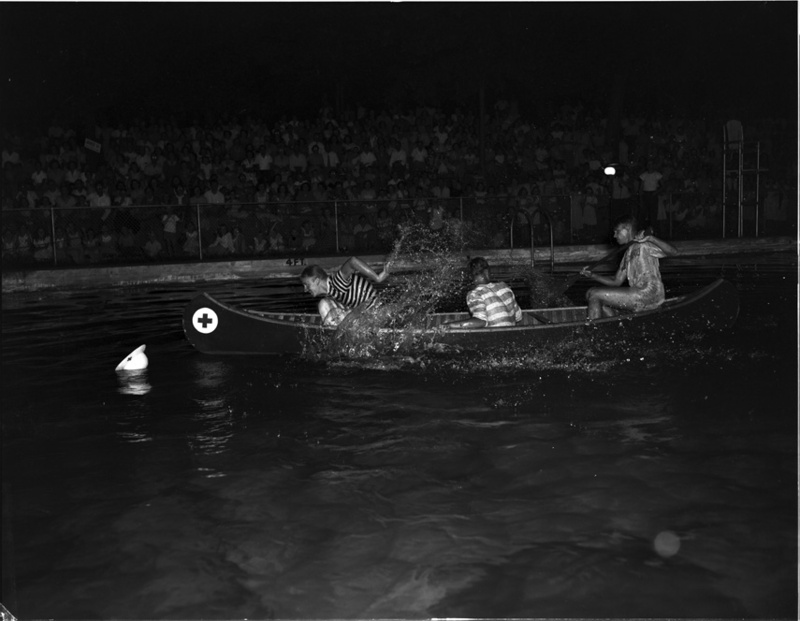 Duke Park Water Pageant, 08.11.49. 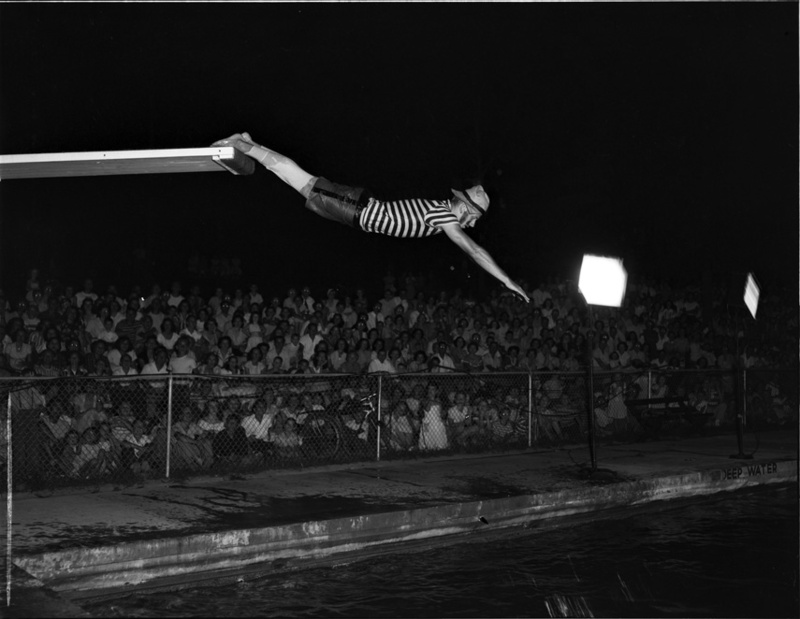 Duke Park pool, 08.23.56 - the headline was "Duke Park Pool with No Swimmers" - due to a polio scare. Duke Park Pool, 08.09.61. I think this is probably staged. I'm putting this in primarily to show the bathhouse in the background. Evidently the bathhouse was renovated in 1962. The park seems to have fallen on harder times in the late 1960s and 1970s, as did many city parks. The reaction of the white populace to the integration of parks (not specifically Duke Park, but all Durham parks) was not to embrace change. I don't know of violence or similar - but community investment in parks declined. Per Barry Ragin, the Duke Park pool closed in 1993 due to "irremediable maintenance issues" that related to the the pool developing a leak into the underground stream below it. I always have to suspect that anything is remediable with enough money, which, granted, Durham Parks and Rec rarely has. Sometime in the early 2000s, as part of the renovation of the play equipment at Duke Park, the pool was removed, and the hole filled in with dirt. The 1933-34 bathhouse has remained shuttered for 15 years, despite the efforts, chronicled by Barry, of the surrounding community to lease the structure from Durham Parks and Rec for a community center. It seems that DPR has a desire to raze the structure, but hasn't done so due to community opposition. So they've opted for traditional option #3 = neglect. It's the standard practice of owners in these situations - if you can wait, try to get the structure to deteriorate enough so that 1) ideally, it falls down of its own accord, 2) you can get a pliable structural engineer to sound the chicken little-esque refrain of "unsafe! unsafe!". Which is all a shame, because Duke Park clearly has the community resources to make this a thriving community center and, by doing so, save a historic structure that helps us remember some of the things we and our elected officials did last time the economic sky was falling. Wow, some very cool photos. AnonI was probably too harsh.